Maps and Prints: We deal in Maps from the 1600s through the 1900s. From the North Pole, circa 1680, to maps of China and Japan, we carry a variety of pieces purchased from private collections. Along with these you will find an assortment of beautiful steel engraved prints with subjects such as portraits, scenery and Civil War battlefields. All are wonderful to the eye, and exciting to the Historian in each of us. We deal in Maps from the 1600s through the 1900s. 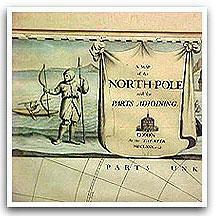 From the North Pole, circa 1680, to maps of <?xml:namespace prefix = st1 ns = "urn:schemas-microsoft-com:office:smarttags" />China and Japan, we carry a variety of pieces purchased from private collections. Along with these you will find an assortment of beautiful steel engraved prints with subjects such as portraits, scenery and Civil War battlefields. All are wonderful to the eye, and exciting to the Historian in each of us.